Relive your best trip with the super, extra-large photo album! 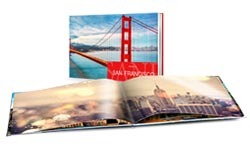 The left and right pages of this album meet seamlessly, so you can easily spread your photos over two pages. We produce your glued album within 6 working days.